Networking: the late Matt Quinn, Gary Reaves and Scott Pelley. Note to readers: The recent death of former WFAA8 reporter Matt Quinn brought to mind a story written 20 years ago about D-FW reporters who achieved network ambitions. Some, such as Gary Reaves, didn't adapt to the travel and impersonal nature of the job. So he went from WFAA8 to CBS News and back again. But one of Reaves' old colleagues, Scott Pelley, left WFAA8 for a network post and has never looked back. Quinn came to WFAA8 from ABC News, whose regimen he didn't like at all. These and other stories are reprised here in an article that was first published on May 13, 1989. Former Channel 5 reporter Bob Schieffer, once a nobody at CBS News, remembers cherishing the compliment as though it were his birthright. His story on the U.S. military's arsenal of lobbyists had pleased the eminent Walter Cronkite, who said so in a brief memo. "I tell you, to have Walter Cronkite praise you for a story was sort of like inheriting 10 million dollars," Schieffer says. "He was very sparing in his compliments." Twenty years later, the torch is passed to CBS News newcomer Scott Pelley, a Channel 8 alumnus to whom Dan Rather warmed quickly. During orientation sessions in New York last month, "Dan sought me out and invited me into his office, and we had a nice, long heart-to-heart talk about the kinds of things CBS News stands for," Pelley says. The next day Rather "came by and gave me a little gift. It was a book we had talk about." It was an autographed copy of The Camera Never Blinks, Rather's account of his broadcasting career. "And just today," Pelley continues, "he came by and told me he liked my story on Mexico. He knows how important it is, when you're new at the network, to hear from somebody like him. When a Dan Rather takes a moment to say, 'Saw the piece; you did a good job,' it makes all the difference in the world." Schieffer, a long-running hit at CBS News, and Pelley, on the run since joining the network March 20, are among dozens of Dallas-Fort Worth television journalists who have made the quantum leap to network news. Some still revel in the glory; others have recoiled from the horror. The biggest plus is prestige, but the minuses sometimes seem to add up faster. Travel, office politics, travel, know-it-all New York producers, travel, etc. Pelley, who waited five years for CBS to hire him, says he "bought a bottle of champagne, went home and said to my wife, 'Congratulate me. I have stepped off the precipice.' "
Although assigned to CBS' Dallas bureau, Pelley has ricocheted through airports and hotels during his first two months with the network. One typically frenetic period, from April 22-28, took him from New York to Atlanta to Dallas to Mexico City to Dallas to Austin and back to New York. "It's more strenuous and hectic than I had anticipated," he says. "Folks here are just constantly on airplanes. But God help me, I love it." Bob Elliott says he bought champagne, too, when he was hired from Dallas-based Channel 4 in 1983 to join NBC News' Houston bureau. "It was the happiest day of my life when I went to the network," Elliott says. "We are trained and conditioned to think that this is the top of the profession." But he learned to loathe a steady diet of disaster stories and hotel-hopping. In October 1986, he quit NBC and returned to his hometown of Portland, Maine. His spot in the Houston bureau was taken by former Channel 8 reporter Jane Peterson, who was dropped when the bureau closed a year later. She returned to her hometown of Minneapolis, hosted a public radio talk show and bounced back to the network level in March as a reporter for the new CNBC cable business channel, owned by NBC. Elliott remains at home, as a feature reporter for NBC affiliate station WCSH-TV. He also teaches a journalism course -- "On the Trail of a TV News Story" -- at the University of Maine. NBC News executives hired him because they liked the breezy style of his City Hall reporting for Channel 4 news, he says. "Then they immediately, from that day forward, tried to change it." "The only news they seemed interested in doing, particularly in the Southwest, was disaster stuff. You end up just spinning your wheels, walking through other people's nightmares. You're thinking idealistically about First Amendment rights and the people's right to know. That's a bunch of bull. All you're going to give them is the latest disaster that happened in their territory." Elliott covered a lot of territory. Houston was home base, but it became an outpost. the wandering reporter soon adapted a ritual. Before going to bed in a hotel, he placed the phone book within arm's reach. It was the only sure way to remember what city he was in the next morning. "You have absolutely no personal life," Elliott says. "Sometimes 30 days would go by and I would never see Houston. I'd just buy new clothes on the road. A day off is spending a day in a hotel in Phoenix. Well, that's great, except you don't know anybody." Matt Quinn, who quit ABC News after two trying years to join Channel 8 in 1980, remembers returning from a trip and discovering that he had been in Topeka, Kan. on network assignment. Hotel receipts verified the visit -- but what was he doing there? He still can't recall. "That was really scary," Quinn says. "I suppose it's dumb to go a network and then not like the travel, but I simply hadn't realized that my reaction to it would be that negative." Quinn also resented taking direction from producers in New York, whose editing of stories from afar often left him seething. "They were not unhappy to see me go," he says. "I was a bigmouth. You can be a bigmouth at Channel 8 with Marty Haag. He doesn't rise from his chair in a puff of smoke and strike you dead." Quinn is referring to Channel 8's news director since 1973. In the last five years, Haag has seen four of his reporters go directly to network news jobs and survive. A fifth, Mike Capps, returned to Channel 8 in 1987 after nine months as manager of ABC News' St. Louis bureau. Capps says he rejoined Channel 8 because he couldn't sell his house in Grand Prairie. 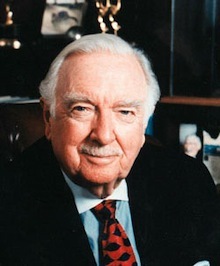 CBS News legend Walter Cronkite once made Bob Schieffer's day. Channel 8 is widely viewed as demanding but fertile proving ground for would-be network correspondents. Says one former Channel 8 reporter: "If you survive at Channel 8, I would think a network job would be a vacation. It's very political and tough at the networks, but it's nothing like having Marty Haag stare at you every day and say, 'Where's your story?' 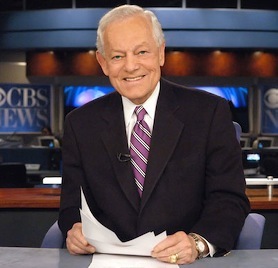 "
CBS' Schieffer says of Haag, "He is an excellent news director, and that is just an excellent news department. I should add parenthetically that we have a fine CBS affiliate (Channel 4) in Dallas, but most of the people seem to want to stay there." One who didn't stay -- renowned ABC reporter Sam Donaldson -- spent a year at Channel 4 as an announcer and occasional reader of the noon news in 1959-60. He sums up the experience in one sentence in his book, Hold On, Mr. President. "I was glad to be back at work," Donaldson writes, "but after a year, decided I had learned as much as I was going to learn there." CBS News has never hired a reporter directly from Channel 4. But the network has a growing Channel 8 alumni club. The three reporters recruited in the 1980s -- Pelley, Gary Reaves and Peter Van Sant -- all had stories on the CBS Evening News last week. "They go because they have the wanderlust, and they want to get rich," Haag says, only half-jokingly. "We lose good people, but I think it's a foregone conclusion that the big fish are going to eat the small fish. It's a frustration, sure, but I'm happy for these people. "They're not making that much more money than they can in local television, and some of them are being worked to death. But still, they're being seen by the entire country. And it's certainly a badge for people to say, 'Well, I've arrived.' "
For some it's a slow arrival. Reaves, who joined CBS News' Chicago bureau in 1986, says that no amount of local news training can prepare a reporter for the realities of network news.
" 'Humblng' doesn't even begin to cover it," he says. "It's funny, because you would think it would be this incredible boost to your ego, having been picked. But they sort of retrain you, and so that 's pretty humbling. "In Dallas," he says, "I knew I was pleasing the people I worked for every day. Here, there's a half-dozen people in New York who go over every word you write and sort of by committee decide whether it's good enough. It seems like when you do get a story on, the stress that you go through is so much greater that it almost takes away the satisfaction . . . There have been many times when I have turned to my wife and asked, 'Why am I doing this?' "
Van Sant, based in CBS News' Atlanta bureau, says that staff reductions at all three networks have made it easier to get stories on the weekday evening newscasts. But that's not necessarily a plus. "You used to have to fight to get on the air," he says. "Now, you have to fight to stay off it. With the cutbacks, anyone with a pulse can get on. "Most of us find ourselves being firemen all the time, just running from story to story without having time to work sources and develop more significant pieces." Van Sant hopes to land saner work someday as a correspondent for one of CBS' three prime-time news magazine programs. Former Channel 5 reporter Charles Murphy has no grand plans anymore. He opened ABC News' Dallas bureau in 1977, and, at age 60, expects to remain in that assignment until retirement. Murphy anchored Channel 5's coverage of the assassination of John F. Kennedy before an impressed NBC hired him the following year. He joined ABC News in 1968. "It's not the golden age of the correspondent anymore," he says. "There aren't too many other old-timers like me still hacking away at it." Murphy specializes in lighthearted features that often end World News Tonight telecasts. But 25 years at the network level doesn't add up to autonomy. He recently completed a story -- or so he thought -- on restaurants that flash-freeze food and send it in overnight mail to their customers. The story was sent back for an attitude adjustment. "I was told it needed more sarcasm," Murphy says.